Here is a rather unpleasant character from largely Alpine Christmas folklore featuring on a rather terrifying Christmas card from the early 1900s. ‘Greetings from the Krampus.’ As a boy and even into manhood Dylan was fascinated and had a great love of the grisly fairy tales that he had read whilst growing up, often reading them to his own children. One of his favourite reads was ‘Struwwelpeter’ a book of Germanic origin containing many children’s morality tales, that if weren’t adhered to, would often see something most unfortunate happen to the main protagonist in the stories. 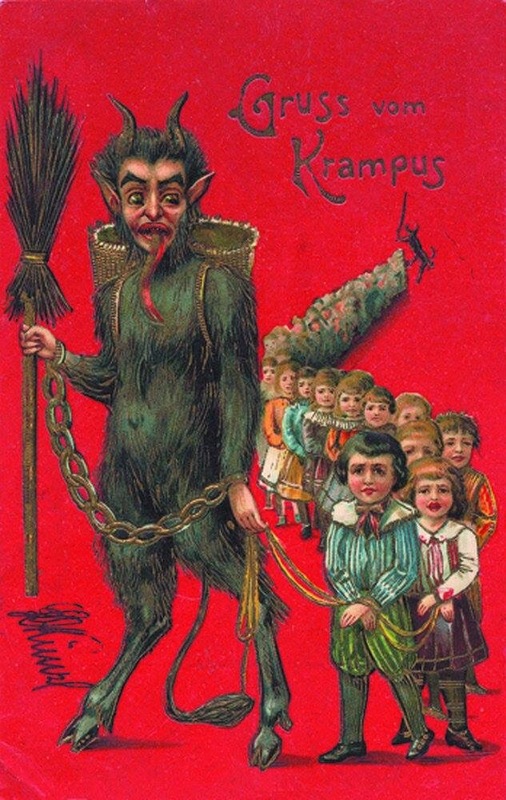 The ‘Krampus’ is a kind of Christmas Devil who takes away children who have misbehaved throughout the year for them to be never seen again. It is typically portrayed as a black, hairy beast with horns,a lolling tongue, cloven hooves, chains, a birch for beating and a sack or basket for trapping the children. The character is not commonly known in Britain but still very much exists in Alpine countries where various traditions are maintained. We know that Dylan was a very mischievous boy growing up, perhaps it may have been different if the tales of the Krampus had been more prominent in British folklore?